Pours a pale straw color with a hint of cold, not as watery looking as some American macro lagers. It has a bright white soapy head that diminishes quickly. There is not much on the nose; typical cereal type of aromas from the malts with little or no scent from the hops, there is also a little sweetness coming through. All and all it’s just your typical lager aroma nothing noticeably pronounced coming through. Ho My! WOW THAT WAS A BAD FIRST TASTE. Gee I remember mom saying “if you don’t have any thing nice to say then don’t say anything at all” This may be a very short review. I’ll keep trying to drink this and see if I can come up with something nice to say. Ok, I got nothing but this is a beer review, so here goes my first negative review, sorry mom. The continuing sips where not as bad as the first. I don’t think I have ever had such a bad reaction to a first sip of beer. I’ve had plenty of startling reactions to first sips, like a Belgian Gueuze, Fruit Lambic or a Flemish Sour, maybe even that first sip of a Shandy, even some extreme micro brews but nothing was so unpleasant tasting as this. I don’t know what they are trying to do with this but whatever it was they missed or if this is their intent than they should stop brewing, at least this lager. All right, that was a little harsh and this is the first of a variety pack that I will continue to review. But I really do not like this beer and they tote some great Midwest Micro Brewing Tradition so maybe I was expecting a better beer than this. Continuing to muster each swallow, it does get a little better, not good but better. There are odd flavors coming out of this beer that I have never had in a lager before. There is a sweetness that you usually get from ale yeast but the grainy flavors of a typical lager are also there and behind that all is just a nasty unpleasantness that I can’t put my finger on. It’s not that skunky taste that you sometimes get in an old or poorly kept lager, these are just not good beer flavors. I DO NOT under any circumstances recommend drinking this beer. Now that’s coming from someone that just admitted to drinking and somewhat enjoying Bud Light Lime (hot summer day and ice cold). I can’t even give this a grade I dislike it so. If it wasn’t for the headache I would drink regular Bud over this any day. 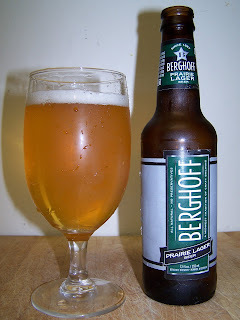 I just looked this up on Beeradvocate.com and it’s categorized as a German Pilsner, wow not even close. Sorry Berghoff, this beer just doesn’t make a grade. Or if you insist on a grade it would be an F. Drink any American macro lager before you attempt to drink this. Some of the guys at work, who've lived here all their lives say that the Berghoff brand was sold a while back and that it went to the dogs after that sale. I'm not sure how that bodes for the rest of the variety pack! Minhas Craft Brewery in WI. The rest of the beers in the variety pack were much better. I have those reviews written up I just need to edit and post them.